Using NuSTAR spacecraft and NICER instrument, an international team of astronomers has found a new accreting millisecond X-ray pulsar. The newly discovered object, designated IGR J17591−2342, is the newest addition to a still short list of known accreting millisecond X-ray pulsars. The finding is reported in a paper published August 30 on the arXiv pre-print server. Astronomers noted that IGR J17591−2342 is located near the center of our Milky Way galaxy, some 28,000 light years away from the Earth. The estimated accretion rate was found to be about 0.52 billionth of one solar mass per year. IGR J17591−2342 is so far the 22nd known AMXP. The authors of the paper underlined that their discovery enriches the census of these objects that are essential for the understanding of the late stages of stellar evolution. 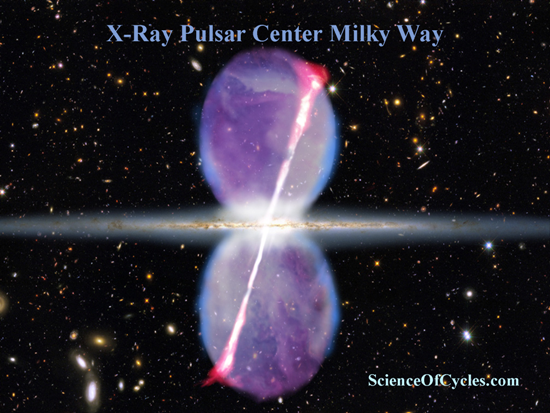 X-ray pulsars exhibit strict periodic variations in X-ray intensity, which can be as short as a fraction of a second. Accreting millisecond X-ray pulsars (AMXPs) are a peculiar type of X-ray pulsars in which short spin periods are caused by long-lasting mass transfer from a low-mass companion star through an accretion disc onto a slow-rotating neutron star. Astronomers perceive AMXPs as astrophysical laboratories that could be crucial in advancing our knowledge about thermonuclear burst processes. To date, only 21 AMXPs have been discovered, with spin periods ranging from 1.7 to 9.5 milliseconds. In order to expand the list of this peculiar objects, the scientific community is still actively searching for such sources using space observatories like NASA’s Nuclear Spectroscopic Telescope Array (NuSTAR) telescope. Recently, a group of researchers led by Andrea Sanna of the University of Cagliari, Italy, has used NuSTAR to identify a new AMXP. The source, named IGR J17591−2342, was initially classified as an X-ray transient by European Space Agency’s INTernational Gamma-Ray Astrophysics Laboratory (INTEGRAL) during galactic center scanning on August 10, 2018. The team observed this source with NuSTAR, which revealed evidence about the nature of this object. Additional observations of the pulsar were conducted using the Neutron Star Interior Composition Explorer (NICER) onboard the International Space Station (ISS). “In this letter, we describe a coherent timing analysis of the NuSTAR and NICER observations that provided the pulsar spin period and binary ephemeris,” the researchers wrote in the paper. The team detected coherent X-ray pulsations around 527.4 Hz (1.9 milliseconds) in the NuSTAR and NICER observations performed almost 25 days from the beginning of the outburst, with a pulse fraction of 15 percent. According to the paper, IGR J17591−2342 has an orbital period of about 8.8 hours. The mass of the neutron star was calculated to be approximately 1.4 solar masses, while the minimum mass of the companion is most likely 0.42 solar masses.